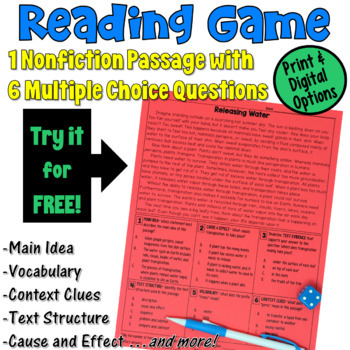 This freebie includes one nonfiction reading passage and six multiple choice questions. 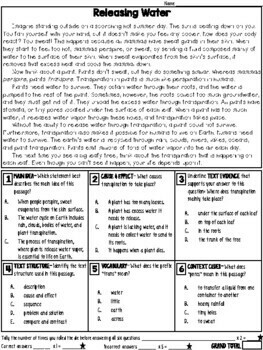 My reading games can be used to help prepare upper elementary students for standardized reading tests in an engaging, fun way. Detailed directions are included for how to play this game. Basically, each player has a passage and a die. 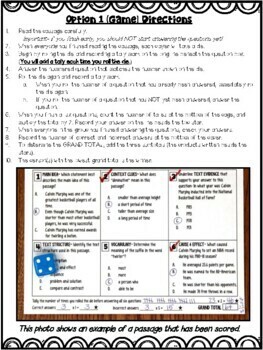 After reading a passage, students independently roll a die and answer the numbered questions that matches the number rolled. They record a tally for each time they roll the die. When complete, they check their answers together. Then, each student follows the directions at the bottom of the page to determine his/her score. The student(s) with the lowest score wins! The directions work for two people playing the game against each other (perhaps at a reading center), a small group of students playing the game (perhaps as a small group activity that is being monitored by a teacher), or a whole class activity. If you like this freebie, be sure to check out my other fiction and nonfiction sets.